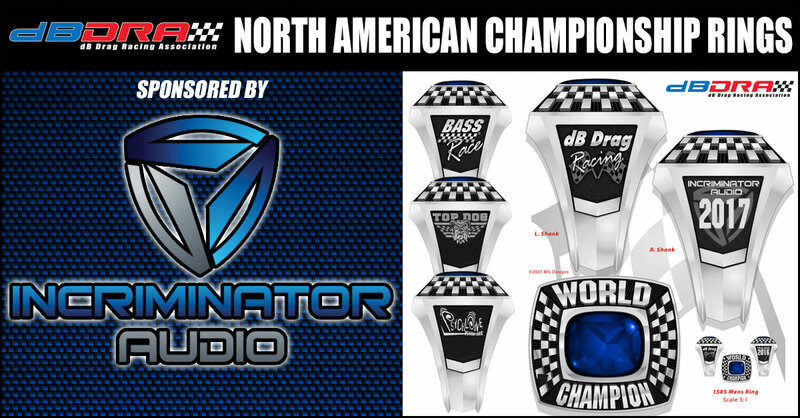 Incriminator Audio will be the exclusive ring sponsor for the dB Drag Racing, Bass Race, Top Dog and Psychlone championship rings that are to be awarded to 1st place North American Champions in 2017! Incriminator Audio is a fast growing company located in North Alabama that manufacturers high quality mobile audio equipment and is being recognized as an industry leader in car audio products. Incriminator Audio attributes much of their success to their customer service and quality high-end products. In addition, Incriminator Audio has a great team of competitors that have dominated many classes of competition in organizations around the world. Custom First Place Championship rings will be awarded in all dB Drag Racing classes, Bass Race classes, Top Dog Class and Psychlone.